Corporate intranet is a powerful tool in the hands of an efficient manager. A corporate intranet is a network that allows authorized users to access or publish information on the network. As a business manager, you can use the various features to more effectively handle your employees. Many businesses fail to realize the potential that a corporate intranet offers. In this article, we will discuss how to use a corporate intranet to streamline management. You can use corporate intranet to streamline management through improved communications. Effective management is all about conveying your expectations to your employees. This is possible whether you’re managing a remote team or meeting with them in-person daily. You can use message boards and front page alerts to notify a large group of employees about specific information. If you want to get more precise, you can chat with your workers or send them direct messages. A corporate intranet offers a communication platform in one location. With this tool, your employees won’t have to have multiple programs like email, video communication, and chat open at once. Use a corporate intranet to promote faster communication amongst your employees. The next logical step to streamlining management with a corporate intranet is to improve teamwork. A good team relies on strong communication and delegation of responsibility. You can have your employees work on group projects through the intranet. The corporate intranet will allow your employees to work on the project no matter where they are. Mobile scheduling apps are available at your fingertips for further remote management. That means they can all collaborate even in separate locations. You can also use the intranet to check which members are working, and which are not. This allows you to cut and replace non productive members of the group. Streamline your team management by getting groups to use the corporate networks. 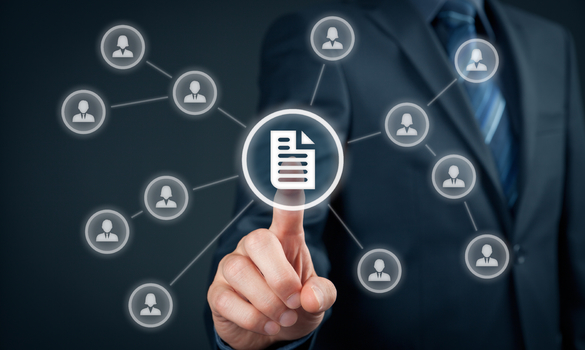 Another way to streamline your management with a corporate intranet is to use document accessibility. You can make all of the necessary spreadsheets and databases available on the network. This will reduce the amount of time your employees spend trying navigating folders, and increase the time they spend working. To further increase efficiency, you should organize documents by department and date. You will also have to spend less time managing which document goes where. Make all of your documents available through the corporate intranet and spend time working on more important matters. Corporate intranets can streamline management by increasing visibility of important information. Many businesses have issues with employees failing to follow standards and guidelines. Don’t waste your time with standards meeting that your employees will tune out. Have all of the pertinent information on the front page of your corporate intranet. This way, your employees will see the guidelines every time that they open the network. You can also prioritize which information that your employees will see. You can use the intranet to enforce knowledge of deadlines and events. Streamline your management by using the intranet to make critical information known to all your employees. An underrated aspect of corporate intranets for streaming management is better internal support. Business grinds to a halt when dealing with technological screw ups. Use a corporate intranet’s built in features to reduce time spent fixing problems. Corporate intranets are often built to self identify issues. This means that your employees will be more productive as they have to deal with less platform bugs. You can also use the internal support to identify potential problems as they arise. This allows you to be proactive with your technical support. Corporate intranets offer better internal support helps you and your employees avoid unnecessary technical hiccups. Using corporate intranet will help you to streamline your management. This can be done efficiently through web meetings. Improve your employees’ efficiency by bolstering communication and teamwork. Increase the time spent actually working by making documents accessible, increasing visibility of important information, and using better internal support. Become a better manager by using a corporate intranet to your advantage.